It's a little strange, this one - and also a little mysterious. 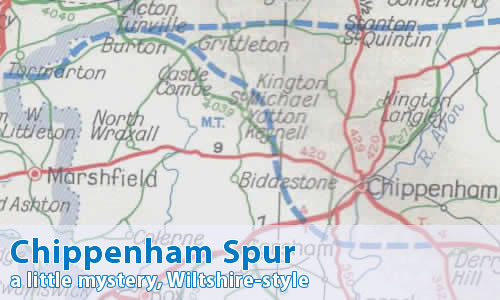 Even its real name is unknown - Chippenham Spur is simply a description. What do you mean by that then? Firstly, I have never found details of its cancellation. It never got particularly close to being built, yet it manages to appear on several maps from the 1960s. Secondly, I can't work out why someone thought it would be needed! Chippenham is a small town, and the motorway was planned to bypass it on the south and west sides, basically linking the A4 to the east of the town, with the M4 to the north west. The route that it takes is one that encourages traffic from the east and south to avoid the town on its way west towards Bristol. However, the M4 was always planned to head east of this point, so why the good people at the Ministry thought that there would be lots of people left travelling along the A4 beats me. I see what you mean - it is quite mysterious, isn't it? Can you show me the full version of that map? Just a thought. From the spur's proximity to Corsham, maybe it was intended to have some defence purpose related to the infamous Burlington bunker? Could the "spur" be a relic of one of the alternative routes proposed for the M4, mistakenly taken up by the map makers? I can't help wondering if this was part of a paper exercise to link the south coast, especially Southampton, with the Midlands. Imagine a route down the M5, onto the M4, via the Chippenham spur and thence via upgraded roads around Devizes and Salisbury. Less building needed than completely rebuilding the A34 and the M40, or upgrading the Cheltenham-Swindon route, both of which were done over the years. Bearing in mind how few really good routes there are in the area even now, it might just make sense to think about this anyway! They have now built a relief road round the southern side of Chippenham, closer to the town than shown on the map. May be the original "Man at the Ministry" was right after all! Now then - i think this proposal got lost in translation somewhere. At one time the M4 was going to take a more southerly route through Wilts, basically running closer to the A4 from Hungerford towards Chippenham then swing northwards to meet the bit already by then under construction from Tormarton (today's J18) via the Severn Bridge to Chepstow and Newport. A road map I recall reading, which I think dates from the early-1960s shows the line of this 'spur' supposedly being the line of the projected M4, with the road west of Tormarton shown as under construction. For what its worth, people in Bath would love North / south traffic to take the A350 to Warminster via Melksham and then down the A36, rather than fight through Bath, despite the wasted opportunity of the Batheaston bypass. Maybe the Chippenham spur anticipated this?